Kirk DeMicco looks back on his role as director on The Croods film for The Official DreamWorks Animation Opus. The Croods gave us the ability to tell a very familiar road trip story in an extraordinarily unfamiliar world. It began as more of a buddy comedy, and didn’t revolve around a family, but became a very different movie when Chris Sanders joined DreamWorks and we started cooking it up together. The story revolves around a caveman named Grug, played by Nicolas Cage. As soon as we made him a father, the whole movie came into focus with the father-daughter relationship at its core. Grug’s family eats together, sleeps together and permanently surround one another in the safety of their cave, until it reaches the point where the teenage daughter, Eep, decides to sneak off from her father — a man who has never taken his eyes off her since she was born. Further friction in their relationship comes in the form of forward-looking Guy, played by Ryan Reynolds. Guy has new and fancy ideas that threaten Grug’s simple way of life. The Croods was a totally original story. It also had what was probably the most original world that you could ever try to create, apart from maybe doing a science fiction movie, because there was absolutely no starting point for us. We could have taken the world in any direction we wanted. The cavemen could have been any shape or size. That was one of the biggest aspects of the movie, and it really demonstrated the talent of the artists because everything came completely from their imaginations. There wasn’t one flower, one leaf, one stone or one tree that pre-existed — we had no shorthand. We couldn’t say, “Oh, let’s just put an oak tree in there,” and somebody just modelled up an oak tree that everybody is familiar with. It is incredible to have that kind of flexibility, but because of this we found it very difficult to find the look of the movie. That job took countless hours over many years, and ultimately the credit should go to our production designer Christophe Lautrette, as well as the animators and all the artists involved. They created a brand-new world with a fresh and unique feel to the animation style throughout, because we wanted to make it look like the cavemen weren’t us — they weren’t just normal humans dressed up in costumes. So, I think the animators and artists had to come up with something truly special, and of course they did. The main challenge for us was that The Croods is a movie without a villain. It’s a journey film depicting man against nature, but there’s nothing else to cut to. When you think about it, the world itself was actually the villain, but the world doesn’t have themes or plans. So, it was very important for us to have scope in this film because we wanted people to go on an amazing journey and see a world they could immerse themselves in. But we also wanted to keep the stakes real. We had a mammoth-giraffe hybrid but it couldn’t be a flying mammoth-giraffe. Once we break the rule that “a mammal cannot fly”, then it becomes science fiction or something akin to Dr. Seuss. The film would lose its resonance and the viewers would start to think, “Oh, I don’t think they’re going to die in this film.” We would lose the emotional punch with our audience that the characters are actually risking their lives. One thing that really made a difference to this new world was the caliber of the effects artists that we had at the studio. With many movies you can be left wondering, “Why is this film animated?” because you can do these movies in live action now. Our effects team, however, went in and made a disaster style movie that you couldn’t do in live action, which was a lot of fun. When Chris and I went to the effects meetings that was one of the highlights in our day. We’d go into these meetings and we would ask things like, “Is it possible to do an entire mountain in the clouds?” And they’d just come up with a solution that would blow us away. Of course, the real magic is always when you’re seeing the effects in context on the big screen but to experience first-hand the amount of work that goes into doing them is hugely inspiring. They invented a whole new system for DreamWorks just to depict tar, and I thought it was so cool. One of the most successful creatures, for me, was the multicolored tiger with the oversized head. I felt that he had a big role in mirroring what Grug was going through. When Grug and the tiger find themselves trapped together in that cave, they were scared of one another but quickly went from enemies to best friends. That tiger became one of the world’s first pets. Despite all of the wonderful wildlife, I think the most memorable scene is the one at the end where Grug paints that hopeful portrait of his family in contrast to the “cautionary paintings” he scared them with at the beginning of the film. We were able through art, not words, to underscore his character arc, which I believe is the power of animation. In my opinion, too many animated films are script-driven and not enough are art-driven. I really have to credit Chris; he was always on the hunt for places in our story where we could strip away the dialogue and just let the music do the work. One thing we discovered through making this movie is that when you take away all the trappings of a modern day existence — your job, your house, your possessions — life just still keeps on going. Without those trappings, the main thing that you’ve got to think about is, “Why are we here? What is our purpose?” What really shocked us was that this story had a deeper meaning and broader implications, and it evolved into far more than just a prehistoric road trip movie. When Chris and I toured around the world with the film after it was finished, many different kids in many different countries told Chris and I in our Q&A sessions that the movie had helped them understand their fathers. We portrayed a very flawed father, but his heart was in the right place, and I think people can relate to that. The film tells us to embrace hope over fear, and this was Eep and Guy’s gift to Grug. 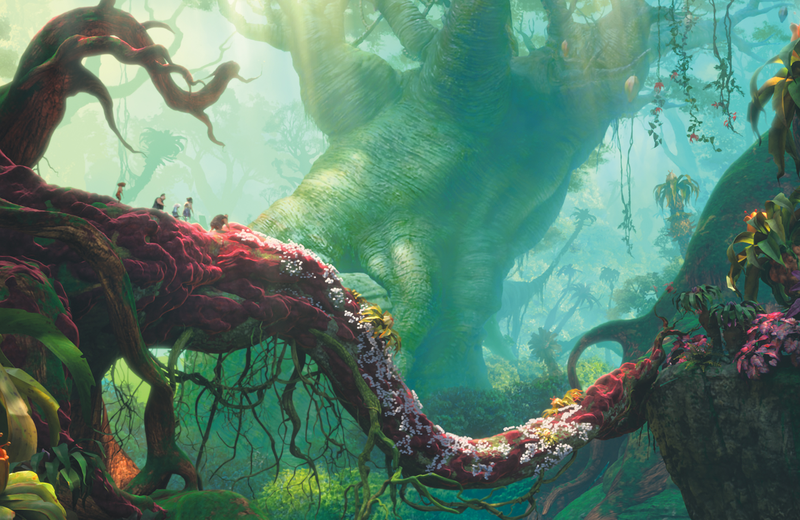 We felt that The Croods summed up the last chapter of the caveman era — the moment in time when the human race first stepped out into the world and had faith in something larger than ourselves. 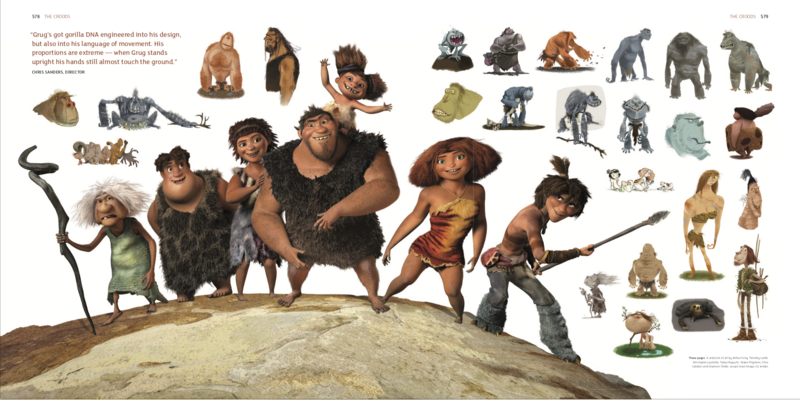 The video below shows how DreamWorks Animation created the world of The Croods.